Nickname(s): Old Dominion; Mother of Presidents; Mother of states. Population Ranked 12th in the U.S.
Ranked 14th in the U.S. The Commonwealth of Virginia is a Southeastern state considered part of the Southern region of the United States of America. It is named after Queen Elizabeth I of England, known as the "Virgin Queen" because she never married. The Virginia Colony was the first part of the Americas to be continuously inhabited by English colonists from its founding. It included area explored by the 1584 expedition of Sir Walter Raleigh, along the coast of North America, and at one time it also included Bermuda (or Virgineola). The Commonwealth was one of the thirteen colonies that revolted against British rule in the American Revolution, helping to form the United States of America. Virginia is known as the "Mother of Presidents," because it is the birthplace of eight U.S. presidents (George Washington, Thomas Jefferson, James Madison, James Monroe, William Henry Harrison, John Tyler, Zachary Taylor, and Woodrow Wilson), more than any other state. Most of the United States' early presidents were from the state. Virginia has a diverse economy, with many federal and military employees in Northern Virginia and Hampton Roads, which have the world's largest office building and the world's largest naval base respectively. In modern times, the Historic Triangle of Colonial Virginia area includes Jamestown, Yorktown, and the restored area and living museum of Colonial Williamsburg. Parts of Virginia are highly urbanized, while the Blue Ridge Parkway, Skyline Drive, Shenandoah National Park, the Appalachian Trail, and Luray Caverns also comprise some of the state's natural scenery. Her shores, mineral springs, mountains, pine and hardwood forests, and spectacular flowering trees have created a beautiful state. 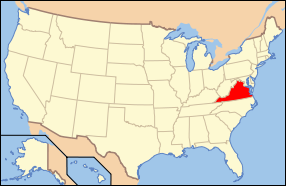 Virginia is bordered by West Virginia, Maryland, and the District of Columbia (across the Potomac River) to the north; by Chesapeake Bay and the Atlantic Ocean to the east; by North Carolina and Tennessee to the south; and by Kentucky and West Virginia to the west. Due to a peculiarity of Virginia's original charter, its northern boundary with Maryland does not extend past the low-water mark of the southern shore of the Potomac River, meaning Maryland possesses the whole width of the river rather than it being split between them. Virginia has an area of 42,774 square miles (110,785 km²), making it the 35th largest state. Ridge and Valley—between the Appalachian Plateau and Allegheny Plateau to the west and the Blue Ridge Mountains to the east. Sometimes referred to as Valley and Ridge. Shenandoah Valley—located within the Ridge and Valley Region; it is referred to geographically—and culturally—as its own region. Blue Ridge Mountains—between the Ridge and Valley Region to the west and the Piedmont region to the east. Foothills—area now recognized directly between the Piedmont and the Blue Ridge Mountains. Pertaining to the counties of Madison, Green, Albemarle, and Nelson. Denotes a region just west of the Southwest Mountains range and north of the James river subject to its own unique microclimate. Piedmont—between the Blue Ridge Mountains to the west and the Tidewater region to the east. Tidewater—between the fall line to the west and the Atlantic coast to the east; it includes the Eastern Shore. Virginia has many National Park Service units, including one national park, the Shenandoah National Park. 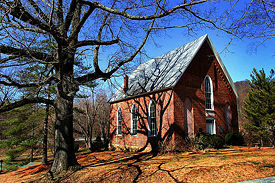 Country church in rural Virginia, built in 1802. The climate is considered mild compared to other areas of the United States. Most of the state east of the Blue Ridge Mountains, plus the southern part of the Shenandoah Valley, has a humid subtropical climate (Koppen climate classification Cfa). In the mountainous areas west of the Blue Ridge, the climate becomes humid continental (Koppen Dfa). Many variations occur because of the state's significant relief. Elevations in Virginia vary from sea level to Mount Rogers at 5,729 ft (1,746 m), with major gradations occurring at the edges of the Atlantic Ocean, the end of the Piedmont, and the Blue Ridge and Allegheny chains of the Appalachian Mountains. The usually moderating influence of the ocean, powered by the Gulf Stream, is interspersed with brief moments of danger due to the potential for hurricanes near the mouth of Chesapeake Bay. On the other hand, cold air masses arrive over the mountains, especially in winter, leading to significant snowfalls. However, in something of an anomaly, much of the state south of Northern Virginia has not had over one foot of snow in a single storm since the Blizzard of 1996. The interaction of these elements with the state's topography create micro-climates in the Shenandoah Valley, the mountainous southwest, and the coastal plains that are slightly, but noticeably, distinct from each other. An additional element in recent years is the expansion of the southern suburbs of Washington, D.C. into northern Virginia, creating an "urban heat island" due to the increased energy output of the city. However, aside from the urban stations, no global warming effects have been noted by Virginia weather stations by 2001. Severe weather is a concern in Virginia. Typically major hurricanes seldom threaten the Virginia coast; hurricanes this far north tend to be weakened. Virginia is often struck with the remnants of systems that bring torrential rain to the state. The state averages anywhere from 30-50 days of thunderstorm activity annually. Eastern Virginia has a lower rate of tornadoes, averaging around 2 tornadoes per year. Virginia has not experienced major seismic activity: Earthquakes rarely register above 4.5 on the Richter magnitude scale. The largest, at 6.0 magnitude, happened in 1897, in Blacksburg. At the time of the English colonization of Virginia, Native American people living in what is now Virginia includes tribes known as the Cherokee, Chesepian, Chickahominy, Chiskiack, Mattaponi, Meherrin, Monacan, Moobs, Nansemond, Nottoway, Pamunkey, Povic, Powhatan, Occoneechees, Rappahannock, Saponites, and others. These people are often divided into three groups, based to a large extent, upon language differences. The largest group are known as the Algonquian, numbering over 10,000, most of whom were united in the Powhatan Confederacy led by Chief Powhatan. The other groups are the Iroquoian (numbering 2,500) and the Siouan. A Spanish exploration party arrived in the lower Chesapeake Bay region of Virginia in 1565, and met the Native peoples living on the Virginia Peninsula. In the fall of 1570, Spanish Jesuits attempted to establish the Ajacan Mission, to be named for St. Mary, on the lower peninsula. The missionaries were killed the following February, leading to the end of Spanish explorations in Virginia by 1572. England began to colonize North America towards the end of the 1500s. Queen Elizabeth I of England (who was known as the "Virgin Queen" because she never married) gave the name "Virginia" to the entire area explored by the 1584 expedition of Sir Walter Raleigh along the coast of North America, from South Carolina to Maine. In 1607, the London Virginia Company, a joint stock company with a proprietary charter financed the first permanent English settlement in the New World, Jamestown, named in honor of King James I, in the Virginia Colony. The settlement was founded by Captain Christopher Newport and Captain John Smith. Many of the original colonists died of starvation. The Virginia Company also took control of Bermuda from 1609, when its flagship wrecked there en route to Jamestown. Its Royal Charter extended to include the Islands of Bermuda, alias The Somers Isles (sometimes known as Virgineola), in 1612. Bermuda remained part of Virginia until 1614, when its administration was given to the Crown. Bermuda and Virginia maintained close links for generations, with many Bermudians settling in Virginia, and Bermudian merchant families establishing trading branches throughout the southern Atlantic Seaboard. Jamestown remained the capital of the Virginia Colony until the State House burned (for the fourth time) in 1698. After the fire, the colonial capital was moved to nearby Middle Plantation, which was renamed Williamsburg in honor of William of Orange, King William III. Virginia was given the title, "Dominion," by King Charles II of England at the time of The Restoration, because of its loyalty during the English Civil War. The nickname, "Old Dominion," is a reference to that. Patrick Henry's speech on the Virginia Resolves. Virginia sent delegates to the Continental Congress in Philadelphia, beginning in 1774. On June 12, 1776, the Virginia Convention adopted the Virginia Declaration of Rights written by George Mason, a document that influenced the Bill of Rights added later to the United States Constitution. Then, on June 29, 1776, the convention adopted a constitution that established Virginia as a commonwealth independent of the British Empire. Patrick Henry, of Charlotte County, Virginia, served as the first Governor of the new commonwealth from 1776 to 1779, and again from 1784 to 1786. In 1780, the capital was moved to Richmond at the urging of then-Governor Thomas Jefferson, who was afraid that Williamsburg's location made it vulnerable to a British attack during the American Revolutionary War. The British surrender at Yorktown on October 19, 1781, ended the major hostilities and secured the independence of the former colonies, despite two more years of sporadic fighting. In 1790, both Virginia and Maryland ceded territory to form the new District of Columbia, but in an Act of the U.S. Congress dated July 9, 1846, the area south of the Potomac that had been ceded by Virginia was retroceded to Virginia effective 1847, and is now Arlington County and part of the City of Alexandria. Richmond was the capital of the Confederacy. Virginia seceded from the Union on April 17, 1861, in response to Lincoln's call for volunteers to attack the Confederate States of America after its attack on Fort Sumter. It turned over its military on June 8 and ratified the Constitution of the Confederate States of America on June 19, whereupon the CSA moved its capitol from Montgomery, Alabama, to Richmond. In 1863, during the Civil War, 48 counties remaining loyal to the Union in the northwest of the state separated from Virginia to form the State of West Virginia, an act which was upheld by the United States Supreme Court in 1870. More battles were fought on Virginia soil than anywhere else in America during the Civil War, including the First Battle of Manassas, Second Battle of Manassas, the Seven Days Battles, the Battle of Fredricksburg and the Battle of Chancellorsville. Virginia did not formally rejoin the union until January 26, 1870, after the end of Reconstruction. 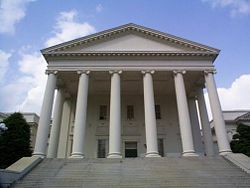 The Virginia Capitol Building, designed by Thomas Jefferson and Charles-Louis Clérisseau, cornerstone was laid by Governor Patrick Henry in 1785. Richmond is the capital city of Virginia. The site of Richmond, at the fall line of the James River in the Piedmont region of the state, was briefly settled by English settlers from Jamestown in 1607, near the site of a significant native settlement. The present city of Richmond was founded in 1737. It became the capital of the Colony and Dominion of Virginia in 1780. During the Revolutionary War period, several notable events occurred in the city, including Patrick Henry's, "Give me liberty or give me death," speech in 1775, at St. John's Church, and the Virginia Statute for Religious Freedom in 1779; the latter of which was written by Thomas Jefferson in the city. During the American Civil War, Richmond served as the capital of the Confederate States of America, and many important Civil War landmarks remain in the city today. As of 2006, the city's estimated population was 192,913, with a metro area population of approximately 1.2 million. In colonial Virginia, the lower house of the legislature was called the House of Burgesses. Together with the Governor's Council, the House of Burgesses made up the "General Assembly." Members of the House of Burgesses were chosen by all those who could vote in the colony. The Burgesses met to make laws for the colony; the Council would then review the laws and either approve or disapprove them. The approval of the Burgesses, the Council, and the governor was needed to pass a law. Electing burgesses gave Virginians a chance to control their own government for the first time, although voting was limited to free white men in the colony. Founded in 1619, the Virginia General Assembly is the oldest existing legislature in the New World. By the 1850s, Virginia had a state legislature, several executive officers, and an independent judiciary. By the time of the Constitution of 1901, the General Assembly had become the legislature, the Supreme Court of Appeals acted as the judiciary, and the eight executive officers were elected; the Governor, Lieutenant Governor, Attorney General, Secretary of the Commonwealth, State Treasurer, Auditor of Public Accounts, Superintendent of Public Instruction and Commissioner of Agriculture and Immigration. Virginia currently functions under the 1971 Constitution, its seventh. Under this Constitution, the government is composed of three branches: Executive, legislative, and judicial. Virginia is one of only five states that elects its state officials in odd numbered years (The others are Kentucky, Louisiana, Mississippi, and New Jersey). Virginia holds elections for these offices every 4 years in the years following Presidential election years. The most powerful officials of the executive branch are the Governor, the Lieutenant Governor, and the Attorney General. They are the only three officials elected statewide. The Governor serves as chief executive officer of the Commonwealth and as commander-in-chief of its militia. The Constitution does not allow a governor to succeed himself in office (though a governor is allowed to serve multiple non-consecutive terms). The Lieutenant Governor, who is not elected on the same ticket as the governor, serves as president of the Senate of Virginia and is first in the line of succession to the governor. The Attorney General is chief legal adviser to the governor and the General Assembly, chief lawyer of the Commonwealth and the head of the Department of Law. The attorney general is second in the line of succession to the governor. Whenever there is a vacancy in all three executive offices of governor, lieutenant governor, and attorney general, then the Speaker of the House of the Virginia House of Delegates becomes governor. Many executive branch agencies have the authority to promulgate regulations. Proposals to create or amend state regulations are often subject to review by the executive branch. The legislative branch or state legislature is the General Assembly, a bicameral body whose 140 members make all laws of the Commonwealth. Members of the Virginia House of Delegates serve two-year terms, while members of the Virginia Senate serve four-year terms. The General Assembly also selects the Commonwealth's Auditor of Public Accounts. The statutory law enacted by the General Assembly is codified in the Code of Virginia. The judicial branch consists of the Supreme Court of Virginia, the Virginia Court of Appeals, the General District Courts, and the Circuit Courts. The Virginia Supreme Court, composed of the chief justice and six other judges, is the highest court in the Commonwealth (although, as with all the states, the U.S. Supreme Court has appellate jurisdiction over decisions by the Virginia Supreme Court involving substantial questions of U.S. Constitution law or constitutional rights). The Chief Justice and the Virginia Supreme Court also serve as the administrative body for the entire Virginia court system. The 95 counties and the 39 independent cities all have their own governments, usually a county board of supervisors or city council, which choose a city manager or county administrator to serve as a professional, non-political chief administrator under the council-manager form of government. There are exceptions, notably Richmond, which has a popularly-elected mayor who serves as chief executive separate from the city council. Local government sets and collects property taxes and tangible personal property tax. Virginia is an alcoholic beverage control state. Distilled spirits, plus wine greater than 14 percent alcohol by volume, are available for off-premises sale solely in state-owned and operated retail outlets. State motto: "Sic semper tyrannis"
Following Reconstruction, the Democratic Party disenfranchised African-Americans by the turn of the twentieth century. Whites in Virginia continued to vote for the Democratic Party, which held a nearly unchallenged majority of state and most federal offices through the middle of the twentieth century. Through the Civil Rights Movement, African Americans regained the franchise and other rights. Conservative whites began to leave the Democratic Party. In 1970, Republican A. Linwood Holton Jr. became the first Republican governor in the twentieth century. Holton was succeeded by two other Republican governors in the 1970s. Virginia has voted for Republicans in every presidential election since 1952, except for the Democratic landslide in 1964. Virginia's current streak of voting for Republicans in ten consecutive presidential elections since 1968, when Richard Nixon began the Southern Strategy, is the longest among the former Confederate States. Despite Virginia's support of Republican presidential candidates and reputation as a conservative state, voters elected Democratic candidates for all three gubernatorial races in the 1980s. In addition, Democratic representatives maintained large majorities in both houses of the Virginia General Assembly. Douglas Wilder was elected governor of Virginia on January 13, 1990; he became the first African-American to serve as governor of a U.S. state since Reconstruction. In the 1990s, Virginia experienced some political realignment, electing conservative Republicans to the Governorship from 1994 until 2002. Republicans captured both houses of the General Assembly and built large majorities replacing conservative and moderate Democrats from rural and suburban areas. Recently, Democrats have been gaining votes in Virginia. In 2004, John Kerry won 45.48 percent of the vote in Virginia, the highest percentage of any Democrat since Jimmy Carter. Under the state constitution, incumbent governors cannot run for re-election. According to the 2004 U.S. Bureau of Economic Analysis report, Virginia’s gross state product was $326.6 billion. The per capita personal income was $35,477 in 2004. In 2006 and 2007, Forbes Magazine voted Virginia as having the best climate for business in the United States, citing economic growth, business costs/incentives, and quality of life. CNBC ranked Virginia as the top state for business in 2007 as well. As of the 2000 census, Virginia had the highest number of counties and independent cities (15) in the top 100 wealthiest jurisdictions in the United States based upon median income, in addition, Virginia tied with Colorado as having the most counties (10) in the top 100 based on per capita income. Loudoun and Fairfax counties in Northern Virginia have the highest and second highest median household income, respectively, of all counties in the United States as of 2006. Virginia's economy is well balanced with diverse sources of income. From the Hampton Roads area to Richmond and down to Lee County in the southwest includes military installations, cattle, tobacco, and peanut farming in Southside Virginia. Tomatoes recently surpassed soy as the most profitable crop in Virginia. Tobacco, peanuts, and hay are also important agricultural products from the commonwealth. Wineries and vineyards in the Northern Neck and along the Blue Ridge Mountains also have become increasingly popular. Northern Virginia (once the state's dairy region) hosts software, communications, consulting, defense contracting, diplomats, and considerable components of the professional government sector. According to the American Electronics Association, Virginia has the highest concentration of technology workers of any state. Computer chips became the state's highest-grossing export in 2006, surpassing its traditional top exports of coal and tobacco, combined. The Dulles Technology Corridor centered on the border of Fairfax County and Loudoun County near Dulles International Airport has a high concentration of Internet, communication technology, and software engineering firms. The state's biotechnology industry is not centralized, but growing, highlighted by the building of the Virginia BioTechnology Research Park biotech incubator in Richmond and the opening of the Howard Hughes Medical Institute's Janelia Farm in Northern Virginia. Virginia's nanotechnology industry, centered in Hampton Roads and Northern Virginia, accounted for $1 billion in manufactured goods in 2006. Researchers in Hampton Roads, many of whom hold patents in the field, believe the region has an advantage in the commercialization of nanotechnology due to the amount of research, much of it spearheaded by NASA's Langley Research Center. Richmond is one of 12 cities in the country having a Federal Reserve bank. It, along with the New York and San Francisco Federal Reserve banks are the only ones that cover a non-state (Washington, D.C.). There are seven Fortune 500 companies headquartered in Northern Virginia, and nine in the Richmond area (most of which are within the city itself.) Only five metro areas in the country have more Fortune 500 companies than the Richmond area. The Pentagon, headquarters of the U.S. Department of Defense in Arlington. One of the major industries in Virginia is the federal government. Government agencies headquartered in Northern Virginia include the Central Intelligence Agency and the Department of Defense, as well as the National Science Foundation, the United States Geological Survey, and the United States Patent and Trademark Office. Many of Northern Virginia's well-educated population work directly for Federal agencies; many others work for defense and security contractors. The Hampton Roads area has the largest concentration of military bases and facilities of any metropolitan area in the world, the largest of these being Naval Station Norfolk. The Hampton Roads area also is home to Air Force and NASA facilities. 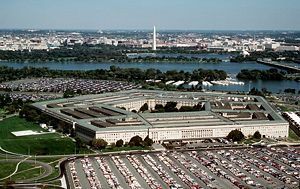 In addition to the Pentagon, U.S. military bases at Arlington, Blackstone, Dahlgren, Fort Belvoir, Fort A.P. Hill, Hampton Roads, Petersburg, and Quantico make Virginia the home of more active duty military personnel than any other state. At $30B in 2001, Virginia received more defense spending than any other state except for California ($31.3B), and more than Texas ($18.1B) and Florida ($13.7B). The state is second to Alaska and ahead of North Dakota and New Mexico in per capita defense spending. Virginia has five major airports: Washington Dulles, Washington Reagan National, Richmond International, Norfolk International, and Newport News/Williamsburg International Airport. Virginia is served by a network of Interstate Highways, arterial highways, several limited-access tollways, railroads, ferries, rapid transit, bridges, tunnels, and even bridge-tunnels. Virginia is home to many shortline railroads, such as the Buckingham Branch Railroad. In the Hampton Roads area, there are three bridge-tunnel complexes known as the Hampton Roads Bridge-Tunnel, the Monitor-Merrimac Memorial Bridge-Tunnel, and the Chesapeake Bay Bridge-Tunnel. Two tunnels and numerous bridges span portions of the Elizabeth River. The James River Bridge, opened in 1928, and rebuilt in the 1970s, spans the James River near its mouth and north of the Monitor-Merrimac Memorial Bridge-Tunnel. Virginia has Amtrak passenger rail service along several corridors, and Virginia Railway Express (VRE) maintains two commuter lines into Washington, D.C., from Fredericksburg and Manassas. The Washington Metro rapid transit system serves Northern Virginia as far west as Fairfax County. The Virginia Department of Transportation operates several free ferries throughout Virginia, the most notable being the Jamestown-Scotland ferry which crosses the James River between historic Jamestown and the community of Scotland in Surry County. The Virginia Department of Education (VDOE) is the administrative agency responsible for the commonwealth's public schools. Headed by the Superintendent of Public Instruction, the Executive Officer of the VDOE also serves as the Secretary of the Virginia Board of Education. According to the popular U.S. News and World Report annual college rankings, two of the top 10 public national universities in the United States are located in Virginia; only California has more institutions in the top 10. The University of Virginia, a World Heritage Site founded by Thomas Jefferson, is ranked #2 and the College of William and Mary, the second-oldest college in America, is ranked #6. Additionally, James Madison University is perennially named the #1 public master's level university in The south. Virginia is also home to the Virginia Military Institute, the oldest state military college in the U.S.
Virginia Commonwealth University is the largest university in Virginia with over 30,000 students, followed closely by George Mason University. Virginia Tech and Virginia State University are the land-grant universities of the state. 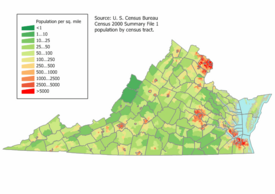 As of 2006, Virginia had an estimated population of 7,642,884, which is an increase of 78,557, or 1.0 percent, from the prior year and an increase of 563,854, or 8.0 percent, since the year 2000. This includes a natural increase since the last census of 276,039 people (that is 633,794 births minus 357,755 deaths) and an increase from net migration of 276,292 people into the commonwealth. Immigration from outside the United States resulted in a net increase of 151,748 people, and migration within the country produced a net increase of 124,544 people. The commonwealth has 940,899 residents who were born outside the United States (8.14 percent of the population), while 99,104 were born in a different state. Also in 2006, 6.58 percent of Virginia's population were reported as under 5 years old, 24.6 percent under 18, and 11.2 percent were senior citizens-65+. Females made up over half of the population. The five largest reported ancestry groups in Virginia are: African (19.6 percent), German (11.7 percent), unspecified American (11.2 percent), English (11.1 percent), Irish (9.8 percent). Historically Virginia was the largest and wealthiest colony and state and the birthplace of Southern and American culture. About half of Virginia's population was made up of enslaved Africans who worked its tobacco, cotton, and hemp plantations. Initially, these slaves were brought from west central Africa, primarily Angola. During the eighteenth century, however, about half were from various ethnicities located in the Niger Delta region of modern day Nigeria. With migration to Virginia of other European groups and sale of enslaved African Americans throughout the Deep South, by 1860, enslaved African Americans represented about one-third of the state's population of 1.6 million. From 1782 to 1818, a wave of slaveholders inspired by the Revolutionary ideals of equality, freed slaves, until the legislature made manumissions more difficult. By 1860, there were 58,042 free people of color (black or mulatto, as classified in the census) in Virginia. The twentieth century Great Migration of blacks from the rural South to the urban North reduced Virginia's black population to about 20 percent. When Douglas Wilder was elected governor of Virginia on January 13, 1990, he became the first African-American to serve as governor of a U.S. state since Reconstruction. Today, African-Americans are concentrated in the eastern and southern Tidewater and Piedmont regions where plantation agriculture was the most dominant. The western mountains are populated primarily by people of heavily Scots-Irish ancestry. There are also sizable numbers of people of German descent in the northwestern mountains and Shenandoah Valley. Because of immigration in the late twentieth century and early twenty-first century, there are rapidly growing populations of Hispanics (particularly Central Americans) and Asians in the northern Virginia suburbs of Washington, DC. In addition, the Hampton Roads area, in particular, has a large Filipino population. Northern Virginia has the largest Vietnamese population on the East Coast, with slightly more than 99,000 Vietnamese migrants. ↑ Factpack (PDF). Virginia General Assembly (January 11, 2007). Retrieved October 14, 2008. ↑ Median household income in the past 12 months (in 2007 inflation-adjusted dollars). American Community Survey. United States Census Bureau (2007). Retrieved September 2, 2008. ↑ 4.0 4.1 Elevations and Distances in the United States. United States Geological Survey (2001). Retrieved October 24, 2011. ↑ Information Please, Land and Water Area of States, 2000. Retrieved December 23, 2007. ↑ Charles A. Grymes, Climate of Virginia. Retrieved December 23, 2007. ↑ University of Virginia Climatology Office, The Hot Get Hotter? Urban Warming and Air Quality. Retrieved December 23, 2007. ↑ Science Blog, Virginia earthquake not a fluke in the seismically active Southeast. Retrieved December 23, 2007. ↑ Robert Doares, Jr., The Life and Literature of Nathaniel Beverley Tucker. Retrieved December 23, 2007. ↑ Kurt Badenhausen, Virginia: The Best State For Business, Forbes Magazine. Retrieved December 25, 2007. ↑ Scott Cohn, America's Top States For Business—On The Road In Virginia, CNBC. Retrieved December 25, 2007. ↑ The Virginian Pilot, 2006 Report on Agricultural Production. Retrieved December 25, 2007. ↑ Matthew Kazmierczak, D.C. Capital Region Is A Growing High-Tech Hub, American Electronics Association. Retrieved June 10, 2008. ↑ Jon W. Glass, Scientists want nanotechnology to go commercial in the region, The Virginian-Pilot. Retrieved December 25, 2007. ↑ Justin Fox, The Federal Job Machine, Time Inc. Retrieved December 25, 2007. ↑ Patricia Buscher, Federal Domestic Spending Up 9 Percent in 2001, Census Bureau Reports, United States Census Bureau. Retrieved December 25, 2007. ↑ U.S. News and World Report, America's Best Colleges 2008; Top Public Liberal Arts Colleges. Retrieved December 25, 2007. ↑ Michael Nicholls and Lenaye Howard, Notes of Manumission: Selected Virginia Counties, ca. 1782-1818, Utah State University. Retrieved November 1, 2007. Billings, Warren M. 2004. A Little Parliament the Virginia General Assembly in the Seventeenth Century. Richmond, VA: Library of Virginia. ISBN 0884902021. Boyer, Paul S. 1993. The Enduring Vision: A History of the American People. Lexington, Mass: D.C. Heath and Co. ISBN 066928114X. Fiske, John. 1897. Old Virginia and her neighbours. Boston: Houghton, Mifflin and Co.
Price, David. 2003. Love and Hate in Jamestown: John Smith, Pocahontas, and the Heart of a New Nation. New York: Knopf. ISBN 0375415416. United States Geological Survey. Science In Your Backyard: Virginia. The Avalon Project at Yale Law School. The First Charter of Virginia; April 10, 1606. The Avalon Project at Yale Law School. The Second Charter of Virginia; May 23, 1609. The Avalon Project at Yale Law School. The Third Charter of Virginia; March 12, 1611. Mr. Nussbaum. Virginia For Kids. This page was last modified on 22 January 2016, at 17:09.